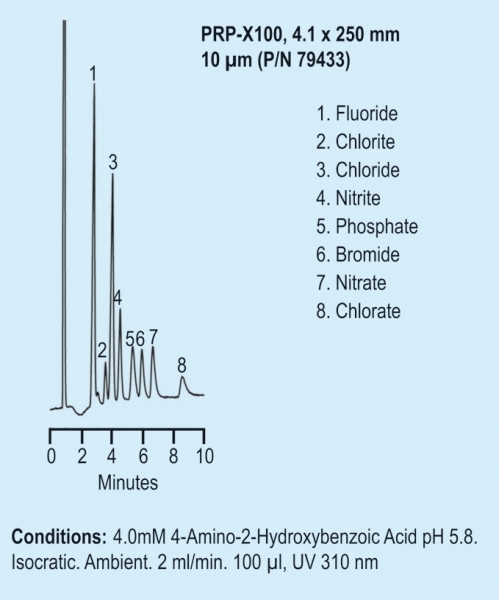 PRP-X100 ion chromatography columns are the easy way to separate inorganic ions.These columns can be used with any existing HPLC or ion chromatograph to easily determine anions in almost any sample matrix including air, water and soil. Highly inert polymeric support resists chemical attack from organic solvents and aqueous buffers (0-100% aqueous or organic; pH 1 to 13), effectively lengthening column life. If column performance should deteriorate (peak broadening and a loss of symmetry), the regeneration protocol will usually return chromatography to its original state. Easily separate difficult anions such as cyanide, borate and silicate at high pH (11.5). The polymeric packing is stable from pH 1 to 13, so a single column can be used for the analysis of both common and difficult anions.